What’s happening in Bend, Oregon for Thanksgiving 2018? 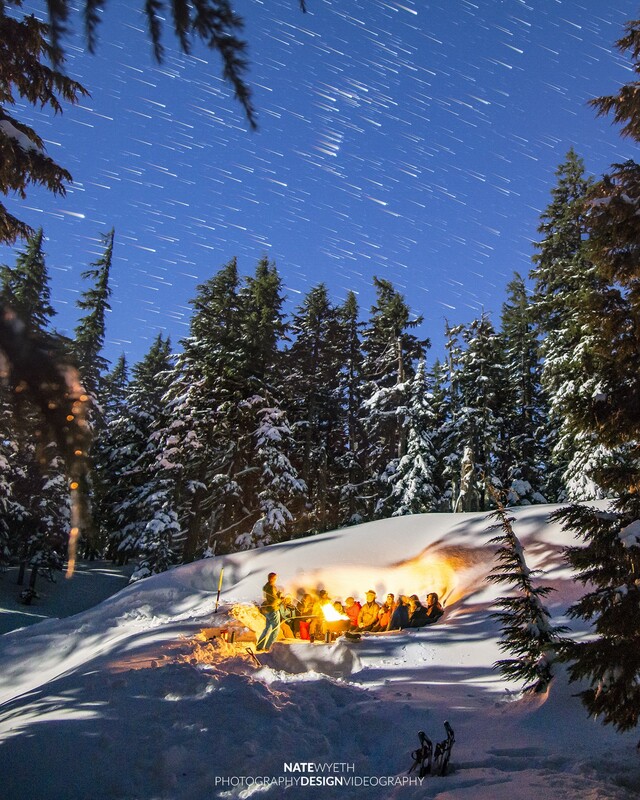 If your Thanksgiving fantasies involve a delicious mix of skiing and mountain biking, blended up with some of the best shopping and dining around, you’re in for a treat during your Bend Thanksgiving vacation. Wondering what’s happening Thanksgiving week in Bend? Gobs of stuff! Here’s what’s in store for everyone who plans to be in Bend, Oregon, for Thanksgiving 2018. First things first. Let’s talk about where you want to have your main meal on November 22 this year. The cozy dining room at Greg’s Grill is one of many spots in Bend where you can enjoy your Thanksgiving dinner this year. For some, the thought of preparing your own feast in the kitchen of your Bend vacation rental has the homey sorta vibe you’re craving. If that’s the case, go here to scope out a variety of vacation homes and condos with ovens waiting to welcome that big, juicy bird. If you’d rather leave the cooking to someone else, you have plenty of options to pick from. A handful of terrific Bend restaurants are standing by ready to make your holiday meal extra special. The Thanksgiving buffet at McMenamins Old St. Francis is one of the most popular offerings in town, with mealtimes offered from noon to 6 p.m. Reservations are required, and the roundup of food will include fresh-carved turkey, fireside port cranberry relish, roasted pork loin with Edgefield cider jus, poached salmon, tortellini salad, garlic green beans, mashed potatoes, stuffing and turkey gravy, along with a wide array of fresh fruit, salads, and desserts. Greg’s Grill in the Old Mill District offers a mouthwatering Thanksgiving menu that starts with your choice of green salad or butternut squash bisque, followed by baked brie with honey, apple, pancetta, and pomegranate molasses. From there you choose your entrée—either rosemary studded rotisserie prime rib ($46), herb-crusted rotisserie turkey ($30), grilled coho salmon ($36), or shrimp Louie salad with grilled prawns ($22). All entrée selections include traditional stuffing, garlic mashed potatoes, roasted brussels sprouts with apples and fall harvest veggies, plus old fashioned pumpkin pie. Other hotspots include 10 Below, Awbrey Glen Golf Club Restaurant, Black Butte Ranch, Brasada Ranch, Broken Top Golf Club, Currents at the Riverhouse, Pronghorn Resort, Pine Tavern, Tetherow, Jackalope Grill, Sunriver Resort, Suttle Lake Lodge, Phoenix Restaurant, and oodles more. Feeling guilty about that sixth helping of mashed potatoes? Never fear, Central Oregon has a variety of Thanksgiving-themed runs and walks to help burn off those extra calories. Run off those Turkey Day calories in one of the running events held around Central Oregon. The I Like Pie Thanksgiving day walk/run kicks off at 9 a.m. in Bend. There will be a timed 5k and 10k run, along with an untimed 5k walk/run and a 1.5k family run. The race starts and finishes on Powerhouse Drive adjacent to the Century Plaza of the Old Mill District. Proceeds benefit Girls on the Run and NeighborImpact. If you feel like visiting one of Bend’s neighboring towns, head a few miles north to Redmond where they’re holding their own Thanksgiving Day Turkey Trot. This is a 5k and 10k event (with a 1k kids’ event to boot!) that will start and finish at the Deschutes County Fairgrounds. Participants can enter to win lift tickets for Hoodoo Resort. The day after Thanksgiving, the annual Turkey Trot is taking place at 10 a.m. in Sunriver. This is an annual 5k fun run/walk with proceeds supporting the Neighborhood Impact program. Costumes are encouraged, with a prize for the most decked-out individuals. 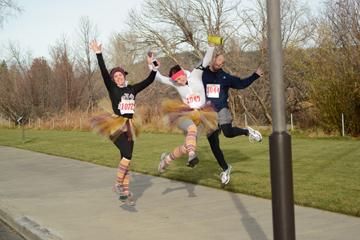 To learn more about these races or other running events in Bend, check out our Event Calendar. Ski and snowboard fans have been waiting breathlessly to see if Mt. 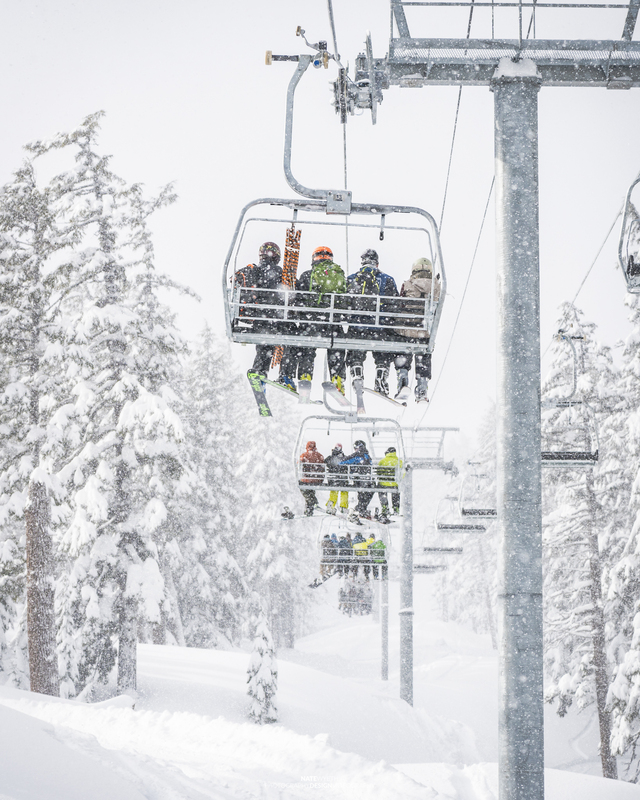 Bachelor will have enough snow to open Thanksgiving weekend. Who’s ready for opening day at Mt. Bachelor? As of this morning (Tuesday, November 20, 2018) opening day is set for Saturday, November 24. This is all dependent on a big storm that’s expected to blow through over the next couple days and pile up great big mountains of snow. Everyone do a snow dance, okay? Not knowing how much snow we’ll get, it’s impossible to give specifics about what will be open. The hope is that they’ll be able to offer skiing and snowboarding from at least one chairlift, and they also plan to have a mini-terrain park set up with rails and boxes. At a minimum, Mt. 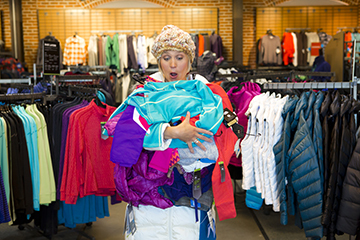 Bachelor will have the Gravity Sports shop open Saturday and Sunday for holiday shoppers seeking gear and apparel. They’ll also have food and beverage service in the West Village Lodge. Keep your eyes on the online condition reports and follow Mt. Bachelor’s Facebook page for up-to-the-minute info about what’s opening and when. For those who favor indoorsy pursuits over outdoorsy ones (or for those who simply love a good bargain), don’t miss the Black Friday shopping deals around town. There are plenty of places to shop ’til you drop in Bend for Black Friday and Small Business Saturday. Bend’s Old Mill District features stores like Victoria’s Secret, Banana Republic, Bath & Body Works, Athleta, Hello Sunshine, and more. Check out their Black Friday Specials page for info on who’s opening at 6 a.m., 7 a.m., and other more sane hours. Also, make a note that Greg’s Grill is offering a special black Friday brunch from 8-11 a.m. Fans of outlet shopping will want to check out the Bend Factory Stores for big bargains. Shops include spots like the Nike Outlet, Eddie Bauer, Columbia Outlet, and much more. For deals at places like Best Buy and Cost Plus World Market, head north to the Cascade Village Shopping Center. And if big-box stores like Macy’s, Kohl’s, and T.J.Maxx are on your agenda, be sure to hit the Bend River Promenade in the middle of town. While you’re on the north end of town, pop into Pomegranate Home & Garden, a locally-owned shop in a historic farm house, for some really unique gifts. To help you spread things out a bit, many shops in Downtown Bend are participating in Small Business Saturday Passport Event. You can pick up your passport in front of Hola! Between 10 a.m. and 4 p.m., and visit more than 50 shops to score great deals while you get your passport stamped. Check out their page for details about shops and specials, including deals at great local boutiques like Hot Box Betty, Local Joe, and Clementine Urban Mercantile. You’ll also have a chance to win prizes and raffle items provided by the downtown businesses. Before we’ve even stashed the Thanksgiving leftovers, a lot of us are gearing up for the next major holiday. If you want to get a jump on Christmas, check out the Old Mill District’s Holiday Happenings page for a roundup of what’s going down. 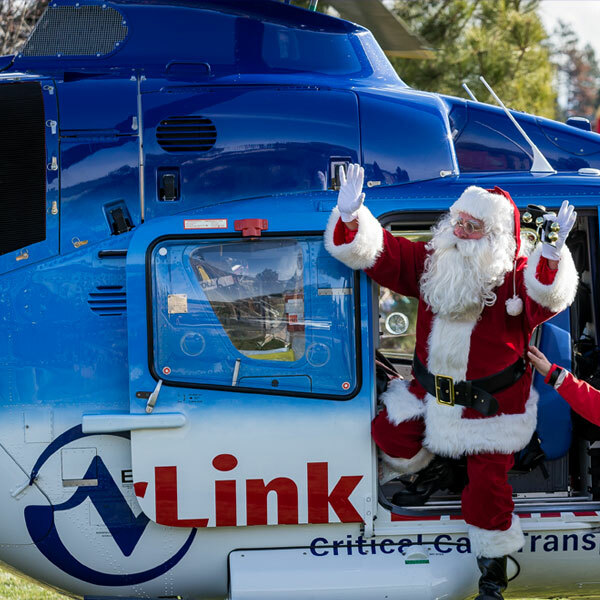 Santa will arrive via helicopter around 10:15 a.m. on Friday, November 23, to begin his tour of duty at Santaland. There will also be oodles of other Christmassy offerings like free carriage rides, carolers, kids’ activities, and more. Go here to see what’s in the lineup. Get ready to watch Santa arrive by helicopter in the Old Mill District. Downtown Bend is another festive place to be, with bright strings of lights and decorations adorning streets and shops. The annual Christmas Tree Lighting is slated for Friday, November 30 this year, so don’t miss that if you’re planning to stick around. The live tree is located at the top of Drake Park near Mirror Pond Plaza, and Crow’s Feet Commons is sponsoring an evening of live music, games, warm drinks, and Santa! The party is from 4-8 p.m. with the tree lighting at 5:28 p.m. (how’s that for precise?!) Afterward, Santa will hang out on Beach Hut Deli’s patio next to the fire pit so kids can chat and have their photo taken with him. He’ll be in this spot every Saturday in December from 12-4 p.m.
And don’t forget the annual Bend Christmas Parade kicking off at noon on Saturday, December 1 in Downtown Bend. Yes, I acknowledge there are Black Friday sales and Christmas tree lightings happening in most towns around America this time of year. Let Wanderlust Tours take you out to commune with the stars. Snowshoe with Wanderlust Tours. Let the naturalist guides at Wanderlust lead you into the wilderness to traipse through pristine fields of pillowy snow. Tours include all gear and transportation, not to mention snacks and warm drinks. They offer daytime or starlight outings, and kids are welcome, too. Visit the High Desert Museum. Bend’s popular High Desert Museum offers fascinating exhibits, cool animals, and tons of opportunities to learn more about the culture and history of the high desert. Check out their website to learn more about the schedule of special events and exhibits at the museum. Special programs at the Tower Theatre. Even if they weren’t having any shows at all, Bend’s historic Tower Theatre would be worth checking out just for the beauty of it. But during the holiday season, you can catch special feature films like Planes, Trains, and Automobiles, along with live productions like The Nutcracker.